Newly released documents reveal that the FBI investigated an extortion threat related to a menacing phone call made to bankruptcy attorney Kristopher Hansen on February 18, 2009, wherein a Trump associate using the name “Carmine” threatened Hansen’s wife and children. Redactions within FBI documents initially indicated that the bureau’s extortion investigation was ongoing as of March 9, 2017. However, in an unusual step the FBI backtracked and claimed that the redaction marking was inadvertent. The threat came as Donald Trump’s casino business went into bankruptcy and Trump Entertainment Resorts had defaulted on payments owed to investors in excess of $1.25 billion. Kristopher Hansen, whose law firm Stroock & Stroock & Lavan represented the investors, received the threatening call on his blackberry from 212-399-5686, a number the FBI later identifies as a pay phone on 54th Street diagonally across from the Ed Sullivan Theater. Donald Trump and his entourage were at the Ed Sullivan Theater that day for a taping of the Tonight Show with David Letterman. The first set of FBI documents (1 & 2) were produced in March as a result of a FOIA lawsuit filed by BuzzFeed News Senior Investigative journalist Jason Leopold, and Massachusetts Institute of Technology PhD candidate and Harvard Klein Center for Internet & Society research affiliate, Ryan Shapiro. Shapiro’s effort is part of #Operation45, a constellation of FOIA lawsuits demanding accountability and transparency from the Trump administration. 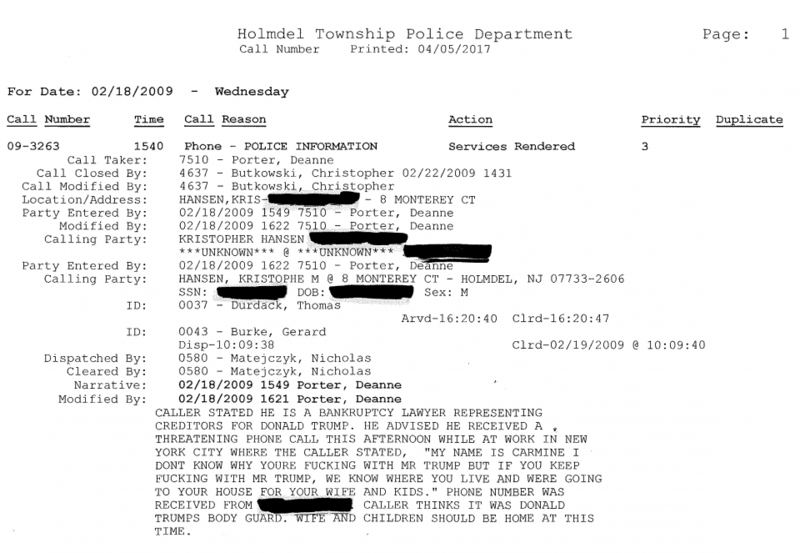 Additional investigation by Leopold and Buzzfeed News returned the Holmdel Township Police report detailing the content of the threatening call. Tagged donald trump, extortion, FBI, FOIA, freedom of information act, Jason Leopold, OP45, operation 45, ryan shapiro, Stormy Daniels, TER management, threat, trump bankruptcy, trump casinos, trump entertainment resorts. WASHINGTON, DC — Multiple federal agencies are in violation of the Freedom of Information Act. Investigative journalist Jason Leopold and Massachusetts Institute of Technology (MIT) PhD candidate/Harvard Klein Center for Internet & Society research affiliate, Ryan Shapiro, filed a lawsuit this morning against the Department of Justice (DOJ), Department of State (DOS), Department of Homeland Security (DHS), the Department of Defense (DOD), the Securities and Exchange Commission (SEC), the Equal Opportunity Employment Commission (EEOC), the Environmental Protection Agency (EPA), and the National Security Agency (NSA). The suit is over the agencies’ failure to comply with Shapiro and Leopold’s Freedom of Information Act (FOIA) request for records on President Trump’s nominee for Attorney General, Jeff Sessions. Shapiro and Leopold submitted FOIA requests to the DOJ, DOS, DHS, DOD, SEC, EEOC, EPA, and NSA for records pertaining to President Trump’s nominee for Attorney General, Jeff Sessions. Jeff Sessions’ nomination for Attorney General is one of the most controversial in American history. Sessions has an extensive track record of opposition to civil rights and civil rights activists, and has decried the Voting Rights Act of 1965 as a “piece of intrusive legislation.” Hounded for decades by allegations of deep-rooted racism, Sessions was rejected for a federal judgeship in 1986 by the Senate Judiciary Committee partially on the sworn statement of a DOJ attorney who testified that Sessions spoke favorably of the Ku Klux Klan and decried the NAACP and ACLU as “un-American” and “Communist-inspired” organizations. Further, the Republicans are forcing President Trump’s nominees through the confirmation process with only the most limited and superficial of hearings. The records Shapiro and Leopold have sued over today will help shed light on the often obscured detailed of Sessions’ history as a state and federal Attorney General and as lawmaker. * Correspondence and other communications from, to, mentioning, or referring to Jeff Sessions. * Records authored or signed by Jeff Sessions regarding Civil Rights cases. * Records pertaining to the conservative political action committee (PAC) Judicial Crisis Network, which is dedicated to securing confirmation of Sessions as Attorney General. * Records pertaining to confirmsession.com, a website and project of Judicial Crisis Network dedicated to securing confirmation of Sessions as Attorney General. 2.) Due to the urgency of the matter, Shapiro and Leopold requested expedited processing of their FOIA requests. The DOJ, DOS, DHS, DOD, SEC, EEOC, EPA, and NSA failed to respond. This is a violation of the Freedom of Information Act. 3.) Not including this new lawsuit, Shapiro and Leopold already have four FOIA lawsuits against the FBI and other federal agencies for records on investigations involving Donald Trump. In the first of these lawsuits, among other things, Operation 45 is suing the FBI and Secret Service for records on Donald Trump’s thinly-veiled assassination remarks regarding Hillary Clinton, and his less than veiled campaign trail call for Russian hacking of Hillary Clinton’s emails. The FBI unlawfully failed to respond to Shapiro and Leopold’s FOIA request, and then slow-walked an initial response to Shapiro and Leopold’s lawsuit until after the election. Notably, the FBI’s response indicates the FBI might indeed be investigating Donald Trump for these incidents. 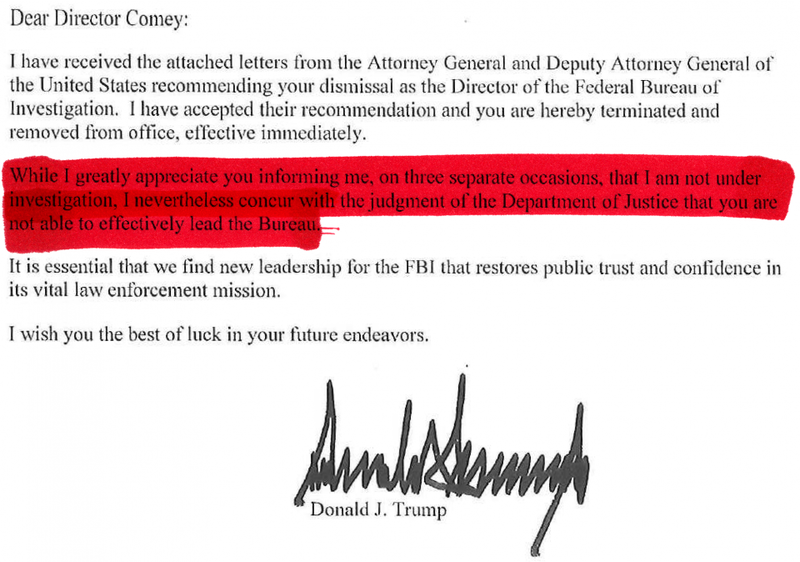 However, in stark contrast to Director Comey’s pre-election rush to inform Congress that the FBI might re-open its investigation of Hillary Clinton, in this case the FBI dragged its feet to avoid revealing the same about Donald Trump until after the election. 4.) In the second of these lawsuits, Operation 45 is suing the FBI for all FBI records on the Trump Organization, the Trump Foundation, Trump Entertainment Resorts, and Trump University. 5.) In the third of these lawsuits, Operation 45 is suing the FBI for records on the FBI’s role in the 2016 U.S. presidential election. 6.) In the fourth of these lawsuits, Operation 45 is suing, the CIA, FBI, Department of Homeland Security (DHS), and the Office of the Director of National Intelligence (ODNI) for records on Russian interference in the 2016 U.S. presidential election, as well as U.S. intelligence agency responses to Russian interference in the election. 7.) Shapiro and Leopold’s lawsuit filed today is part of the work of Operation 45. Operation 45 is a new 501(c)(3) charitable organization founded by MIT/Harvard’s Shapiro, and attorney Jeffrey Light, to ensure transparency and accountability for the incoming Trump/Pence administration. “Given Trump’s authoritarian aspirations and overt contempt for the Constitution and a free press, American civil liberties and privacy now face a profoundly clear and present danger. “Secrecy is a cancer on the body of democracy. “The democratic process cannot meaningfully function without an informed citizenry, and such a citizenry is impossible without broad public access to information about the operations of government. Tagged AG, Attorney General, CIA, DHS, donald trump, EPA, FBI, FOIA, freedom of information act, Jason Leopold, Jeff Sessions, Jeffrey Sessions, ODNI, OP45, operation 45, Russia, ryan shapiro, State Department. WASHINGTON, DC — The CIA, FBI, Department of Homeland Security (DHS), and the Office of the Director of National Intelligence (ODNI) are in violation of the Freedom of Information Act. Investigative journalist Jason Leopold and Massachusetts Institute of Technology (MIT) PhD candidate/Harvard Klein Center for Internet & Society research affiliate, Ryan Shapiro, filed a lawsuit yesterday against the FBI, CIA, DHS, and ODNI. The suit is over the agencies’ failures to comply with Shapiro and Leopold’s Freedom of Information Act (FOIA) requests for records on Russian interference in the 2016 U.S. presidential election. Shapiro and Leopold submitted FOIA requests to the CIA, FBI, DHS, and ODNI for records pertaining to Russian interference in the 2016 U.S. presidential election, as well as records pertaining to U.S. intelligence agency operations involving any such Russian interference. * What information on Russian interference did U.S. intelligence agencies possess, and when did they possess it? * How did this information differ by agency? * How did analysis of this information, and response proposals based upon that analysis, differ by agency? * How did U.S. intelligence agencies communicate and coordinate with each other regarding the issue of Russian interference? * Both officially and unofficially, how did U.S. intelligence agencies communicate and coordinate with outside entities and individuals regarding the issue of Russian interference? Tagged 2016, CIA, DHS, donald trump, FBI, FOIA, freedom of information act, hacking, james comey, Jason Leopold, ODNI, Russia, ryan shapiro.